• Nutmeg powder - 1 pinch. • Amchur powder - 1 tea spoon. • Spinach-palak - 1 bunch. • Kasoori methi - 1/2 tea spoon. In a bowl add chopped garlic, butter, salt, amchur powder, nut meg powder, garam masala powder, chilly powder, Kasuri methi powder, mix this masala and add spinach (blanch it and chop them), paneer mix this and divide them into equal portions. Wheat flour dough also divide equal portion, help with rolling pin roll the small disk shape and stuff the paneer and palak mixture and seal it and roll them into round shape sheet and place the paratha on the hot griddle and cook with butter on both sides. Serve this with curd, pickle. Palak paneer paratha recipe here Spinach paratha stuffed with spiced cottage cheese. This is the most beautiful looking paratha amongst all. This can be offered with Indian bread or roti or naan. The rich and creamy spinach curry and the... Read More.. This can be offered with Indian bread or roti or naan. The rich and creamy spinach curry and the soft paneer melts inside your mouth and will be an ideal dish for any party or a celebration. Palak paneer is certainly not but pan-fried fresh, soft Indian milk cheese (paneer) in a very slightly spiced spinach (Palak) gravy. Spinach is just one of those veggies which is categorized within the “good for you” type for parents, and the “can’t stand the stuff” group for their kids. Most kids (and grownups) that I are aware of really like paneer, and I have lots of Indian mother’s state that Palak Paneer is one means they're able to get their children eat spinach. Palak is extremely healthy and coupled with paneer takes care of calcium, iron and necessary protein levels of the body. Buffalo milk was most traditionally used for making paneer as fat content in it is about 5%. But nowadays whole milk is usually used as it is ready available. Low fat paneer of acceptable quality can be made from cow milk standardized into a fat content of 3%. Grass fed natural milk will provide you with the best flavor paneer. In nowadays, a lot of the international restaurant in India also provide paneer as one of the flavor in wraps, pizza topping or even in sandwiches. Great recipe, and very well explained. Sooooo Awesome! :) Thanks Chef! you always make me not just want to eat but want to cook these recipes too. Thank you so much for not just the recipes but the enthusiastic way you present them. chef , what is nut mage? 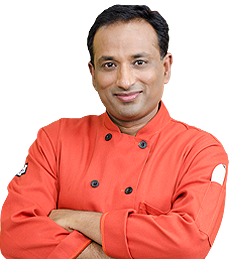 hello sir i am uma shashidhar from bangalore i am u r fan i like u r recipes very much please show me all types of soups.